Regardless of how this review will be perceived I want to express my sincere admiration for Chad Davis, the man behind Hour of 13. It is very rare when one man can compose and play instruments for his band with such balance and restraint. I can guarantee that without being told no one will ever be able to figure Hour of 13 to have only two doom warriors behind it. Phil Swanson (formerly of many bands including Atlantean Kodex) contributes his Robin’s vocals to Chad Davis’ Batman instrumental prowess completing the picture. From the mood setting opener The Gathering psychedelic fog sets firm, wafting all over the Hour of 13 sound. All burden of the compositions resting squarely on his shoulders, Chad Davis shows that he is an ardent student of the 70s. He truly makes that century of heavy metal music come alive on The Ritualist, for those who had a chance to hear it back in the day, or truly paint a vivid picture for those who had the privilege to be born later in the time continuum. 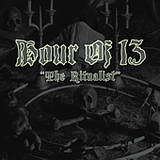 The Ritualists is one of the top songs on the album with its grumbling riffs and the entire set of necessary hooks rolling right along its unhurried path. Naked Star is reminiscent of Pagan Altar with Phil sounding very much like Ozzy, his voice coming as if from the echoing chamber. Demons All Around Me is pure mid-70s Judas Priest definitely after Rocka Rolla, but before British Steel was discovered. It even has the classic 2-part song structure, with the slower hazy dreaminess growing into alarmist guitar tone, abandoning the profound chorus hook. With its completely distinct and pure psychedelic doom atmosphere, somehow The Ritualist failed to ensnare me completely. The word “excitement” is somehow ill-fitting for an album of this genre and direction, but Hour of 13 never set up an inescapable trap for me. Phil’s voice, all Ozzy-like piercing weepiness and all, is not strong enough to carry melodies all by himself, and given that every song revolves pretty much around a 1-2 riff combination, it does begin to sound a bit repetitive somehow by the middle of the album. The closer The Crawlspace saves the final impression making the same riff go from funeral to mildly accelerated catchy chug, but the second half of the album is a little dreary and tiresome. To compensate for the lack of melodicism in vocalized verses, or so I think, Chad goes on long-winded jams come Possession, and since some of his leads are somewhat inharmonious (The Ritualists, Possession) they distract rather than add. The drum rolls are tasteful and help carry the songs throughout, but riffs are certainly Chad’s stronger suit compared to leads, except maybe the one on Soldiers of Satan. Four songs into the album I felt I knew all there is to know about Hour of 13, and if things stayed there, at say the EP level, we would be talking the Surprise of the Month factor here. More material in the case of The Ritualist meant less in the end, as with the second half of the volume half of the substance was certainly not added. I want to invite you, however, to make your own impressions, especially if the 70s is the decade in metal you don’t mind exploring.